Preservation Week is an effort to promote preservation and conservation for cultural heritage materials throughout the United States. 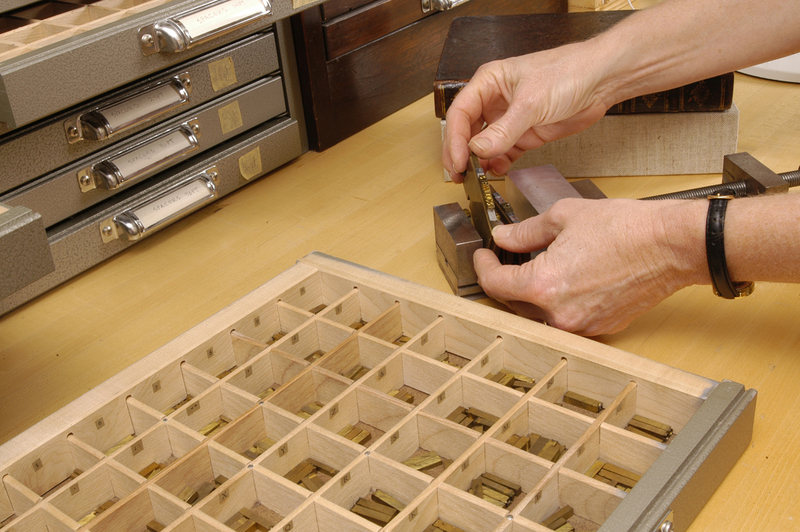 In 2004, Heritage Preservation performed the first national survey to document the preservation needs of cultural collections held in libraries, archives, and museums. The survey, now known as the Heritage Health Index, reflected a shocking number of cultural materials at risk and in need of some sort of care or treatment. 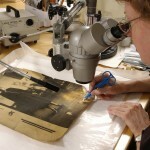 In response to revealing the alarming amount of collection materials at risk, the American Library Association partnered with the Library of Congress, Institute of Museum and Library Services, American Institute for Conservation, Society of American Archivists, and Heritage Preservation, to highlight the needs of our national treasures and to educate the public on preserving family treasures. These organizations also worked to raise awareness of the important role that preservation and conservation professionals serve within their institutions and the community. 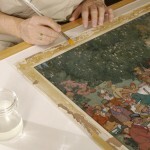 The conservation department at the Harry Ransom Center, founded in 1980, is charged with the care of the Center’s collections. This responsibility poses ongoing and rewarding challenges in the areas of treatment, preventive care, research, and education. 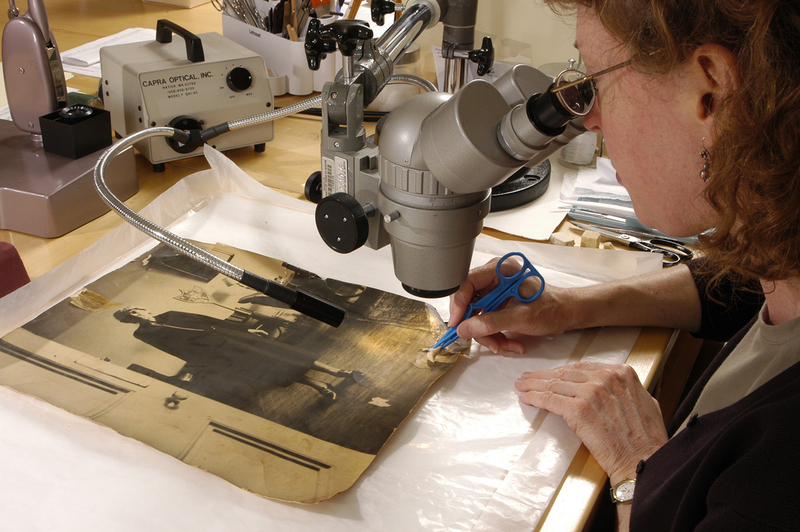 With book, paper, and photograph conservation laboratories and a preservation housing lab, the department accomplishes a tremendous amount of preventive care and conservation treatment. In the past fiscal year, the Ransom Center’s talented staff of conservators, technicians, interns, and volunteers devoted nearly 2,500 hours to conserve more than 3,000 items from the collections. In addition to treatments, the staff worked on surveys, assessments, inspections, teaching, consulting, research, and contributed service to the Center and The University of Texas at Austin in other engaged ways such as answering collection care questions from professionals and the public, welcoming the public to Explore UT Day, giving presentations for local and national audiences, and leading departmental tours. 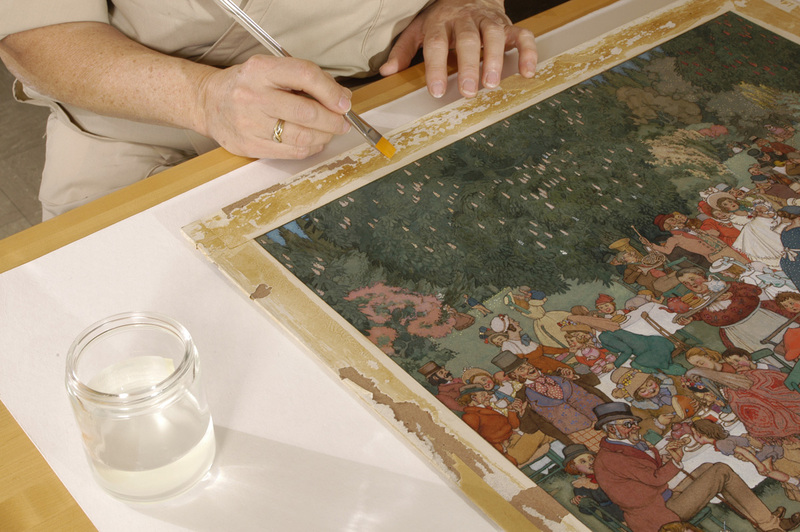 Learn more about the Ransom Center’s conservation department. Read related Preservation Week 2015 posts. Softening adhesive on the border of the drawing, “The Christening Party” by W. H. Robinson. Photo by Eric Beggs. 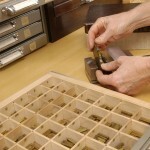 Setting brass type in a pallet to stamp a label for a book. Photo by Eric Beggs. 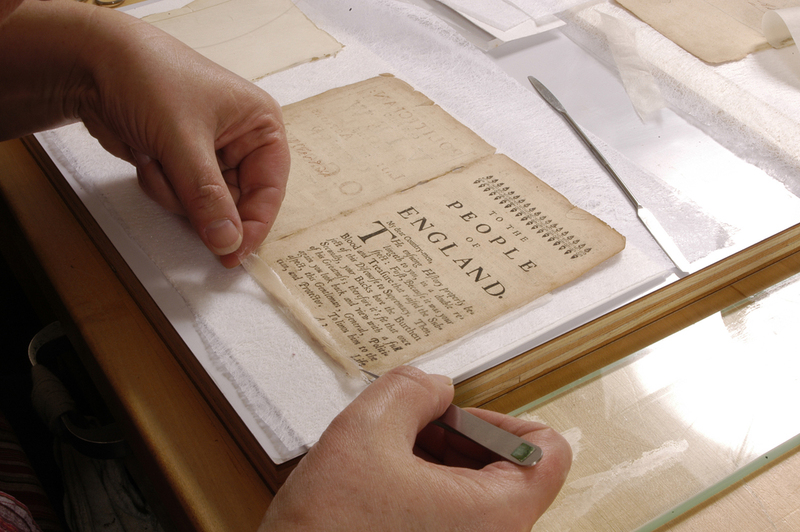 Mending a folio from “The Perfect Politician: Or, a Full View of The Life and Actions of Oliver Cromwel.” Photo by Eric Beggs. Surface cleaning a portrait of British author Ivy Compton-Burnett. Photo by Eric Beggs. The Ransom Center has acquired 21 previously unrecorded and unpublished letters by author J. D. Salinger. The letters are accessible as part of the Ransom Center’s existing Salinger collection, which includes published and unpublished manuscripts, galleys, page proofs, and correspondence. Most of the newly acquired letters are written by Salinger to Ruth Smith Maier, a classmate and friend he met at Ursinus College. Salinger attended Ursinus College in Collegeville, Pennsylvania, in the fall of 1938, but he quit midterm and returned to New York City. He and Maier maintained a 40-year correspondence in which Salinger commented on a wide range of topics including his literary ambitions, his writing, and his family life. A number of letters offer insight into his evolving attitude toward public exposure and cast light on his decision to withhold new work from public view. The acquisition also includes copies of Ruth Smith Maier’s letters to Salinger and a draft of the first letter Christopher Maier sent the author. The Ransom Center’s Salinger collection was established in 1968 and has been augmented with subsequent additions over many years. The Ransom Center is one of a handful of institutions that hold original Salinger manuscripts, including Princeton University, Harvard University, the New York Public Library, the Library of Congress, and the Morgan Library.